Stop me if you’ve heard this before… Bayern Munich is an old team that needs to refresh and reload its aging core. Last night’s 2-2 draw against two-time, and let’s face it, huge favorite for the Champions League again, champion Real Madrid didn’t particularly expose this issue too much (save for showing just how slow Thomas Mueller has become, both in the physical and mental sense), but the first leg showed more than enough evidence of this fact. Where Real Madrid was spry and quick on the ball, Bayern was lethargic, and there was no better encapsulation of this fact than in the goal Marco Asensio scored to put Real up 2-1. Real Madrid pounced on a Rafinha error, with Asensio and Lucas Vazquez speeding past the center circle, confident that no one on Munich would catch up. They were right. This lethargy was even more evident on the other side of the ball, with Jupp Heynckes fielding Arjen Robben and Franck Ribery like it was 2013. Arjen Robben didn’t even make it the entire game and was pulled off with a groin injury that saw him miss the second leg last night. On the other flank, once Robben was off, Ribery was left on an island, and his ‘spirited’ runs left a lot to be desired. There wasn’t a bigger indictment on Bayern’s state of affairs than in the image of Ribery attacking Carvajal and Lucas Vazquez, unable to beat them off the dribble and shooting in vain. 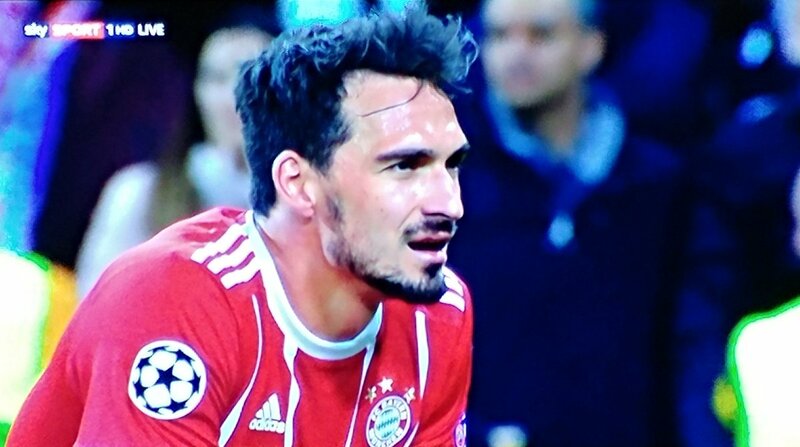 Maybe if Bayern would have kept Douglas Costa, or Kingsley Coman wasn’t injured, it would have been different, but with the aging core of Robbery, Madrid was confident that the flanks would pose no danger to their defense. While we’re here, I’d be remiss if I didn’t say a word or six about Robert Lewandowski, Bayern Munich’s supposedly world-class center forward. There was a time where the Pole was seen as superior to Barcelona’s Luis Suarez, but on the evidence of these two legs, I’d rather have Karim Benzema, supposedly a center forward who doesn’t score goals (he had two last night, but I’m sleep, doe). 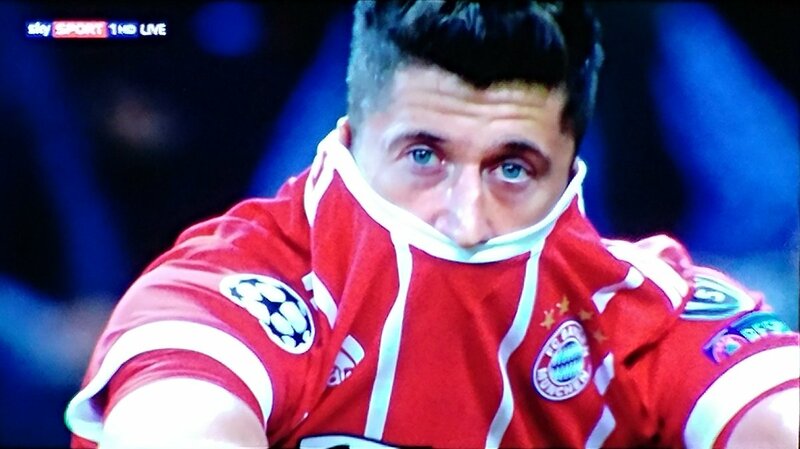 Not only was Lewa a bum in front of goal, but in stark contrast to his counterpart on Madrid, he didn’t offer anything else. Where Benzema was contributing to the buildup of an attack, Robert was static, seemingly waiting for a ball to come his way (so he can blast it over the bar). I’m not going to bury Thomas Mueller because he seems to be doing a good job of doing that himself, but him starting a game in 2018 sounds extremely dumb. (Yes, much like Real did all game last night, I’m going to ignore Tommy Boy.) And this is where I get to the meat of the issue: Jupp Heynckes didn’t do his team any favors fielding that lineup. The hiring of Jupp after Carlo was supposed to bring stability after the Italian’s methods fell on deaf ears. What it really brought was an unoriginal regression, a retread that left the Bavarian outfit bereft of ideas and a coherent plan. It also showed how outdated and old their players are, which is something that was evident even when Pep Guardiola was in charge. There are many reasons for this, including the aforementioned choice of manager. Bayern Munich’s transfer policy of buying up all good German talent, with little to no disregard to players abroad, seems to highlight the club’s need to solely dominate domestically, which is the opposite mandate of the club that just knocked them out. Where Bayern Munich want to be recognized as the sole German superclub, stripping all other clubs in the Bundesliga of their talent, Real Madrid doesn’t seem to care about domestic competition, focusing their efforts on claiming one Champions League after another. If they win a Liga, like they did last year, then that’s just a bonus. Which brings me to another issue: being the sole superclub domestically practically ensures no competition domestically. Bayern is rarely if ever, challenged domestically in March and April, and when faced with superior European teams, can’t take their games up a notch. Bayern, in short, has no ‘playoff gear’. 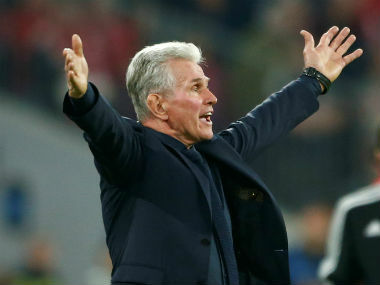 People will probably point to Jupp’s last tenure in charge when Bayern last won the European competition. But consider this: Heynckes knew this was his last hurrah, announcing his retirement in December, and in the semifinal, faced a skeleton crew Barcelona team whose manager was undergoing chemotherapy (RIP Tito Vilanova). In the final? They faced German club Borussia Dortmund, their domestic rival who were without Mario Gotze, their wunderkind and Rihanna posse member who was purchased by Bayern prior to the final. In the grand scheme of things, Bayern’s aging core was good enough to win the Bundesliga, but it just ain’t good enough. Turns out it’s really hard to ring up 25 percent possession and win a football match. Getafe learned this the hard way at Real Betis, who came back from a 2-0 deficit to draw 2-2. Barça reject Cristian Tello was brilliant in the second half, assisting goals for Tonny Sanabria (his seventh in seven games!) and Ryad Boudebouz. Valencia won yet again. I know, you’re shocked. The 3-0 result was a tad unfortunate for Leganés — whose gleaming defensive record has taken a hit the last two weeks — but this Valencia side is different from the luck dragons that nearly finished third in 2014/15. No, Marcelino’s men lead the league in goals, haven’t dropped points in nearly two months and showed they can control games with the ball as well as on the counter. Cumulative heat map, Valencia-Leganés, 11/4/2017. Again, Atlético Madrid played poorly. Again, they failed to maximize their talent and struggled to string passes together. And again, they stole three points from Deportivo La Coruña after Thomas Partey — their LEADING SCORER — curled in from 20+ yards in stoppage time. Diego Simeone’s men are still unbeaten; we’ll see if they remain that way after the Madrid Derby in a fortnight. Alavés finally got some luck to go their way in a 1-0 win over an insipid 10-man Espanyol. I just love a game that sees a first-minute goal and nothing else — especially a first-minute goal this bonkers. Thank you, Christian Santos. What stood out to me about Barcelona‘s 2-1 home win over Sevilla — well, other than apparent winger Paco Alcácer doing the damn thing and scoring a brace — was Ernesto Valverde’s substitutions. Paulinho replaced Andrés Iniesta on the hour, moments before Alcácer scored his second to fire Barça into the lead. Valverde then took off Paco and replaced him with a more natural wide player in Gerard Deulofeu. And he threw on Javier Mascherano for stoppage time, thus ending the game with Paulino, Masche and Sergio Busquets in midfield. No one can complain, though, as Barça won for the 10th time in 11 and maintained a four-point edge at the top. More like Gi-roll-na, am I right? (Please don’t hate me.) That’s three straight wins for the new boys after they beat Levante 2-1 away. Girona are 10th and four points off a European place! Yeah, so, this is really rough viewing for Athletic Club fans. A 10-minute, three-goal Celta Vigo rampage did in the visitors in a showdown between under-fire rookie managers, and my guess is Athletic’s Cuco Ziganda isn’t long for his job — tends to happen when your team is a shambles and can’t defend crosses. Meanwhile, my boy Iago Aspas (I am convinced we have the exact same star tattoo) bagged a brace and Pione Sisto an assist — the Danish winger leads LaLiga with seven helpers. Pablo Fornals showed former team Málaga what they’re missing and showed former manager Fran Escribá why he should never have been played as a wide man. The 21-year-old pulled the strings behind strikers Carlos Bacca and Cédric Bakambu throughout Villarreal‘s 2-0 home win, but it was substitute Nicola Sansone who got the goals in the 68th and 76th minute (Fornals assisted the latter with a sick threaded pass). Bakambu recorded a hat trick of offside goals; he later compared it to being put in the friend zone. Amazing. Well, that’s the Real Madrid “crisis” over, then. The champions strolled to a 3-0 win over Las Palmas (who played ok for a little while at the Bernabéu but will soon be looking for their third manager of the season). Marco Asensio scored perhaps the goal of the weekend with a vicious rising volley that I’m sure you’ve seen 12,000 times. Valencia continued its pulsating start to the season with a 2-1 win at rock-bottom Alavés. Giovanni de Biasi’s men gave los Che the ball, but they still managed to score off two errors: a giveaway which resulted in a Simone Zaza strike (his ninth of the season) and a penalty tucked away by Rodrigo. Atlético Madrid simply cannot get out of their own way. They played really well for about 65 minutes of their 1-1 home draw with Villarreal, but dropped more points from a winning position (and failed to make Ángel Correa’s stunning opener stand up) when Carlos Bacca nodded in with less than 10 minutes left. Despite their struggles, though, Atlético are unbeaten through 10 weeks and tied for third. Athletic Club always give Barcelona a good game, and Saturday at San Mamés was no different. Cuco Ziganda’s out-of-form and shorthanded side made Barça work for a 2-0 win that I think was somewhat harsh; Athletic really did have good opportunities in the second half. But one side had Paulinho, the other didn’t. Like, who cares about Messi? They should rename it the Paulinho d’Or. Big win for Sevilla in a game which ended after midnight at the Sánchez Pizjuán. Pablo Sarabia put the team on his back and carried them to a 2-1 win over plucky Leganés. Eduardo Berizzo needs someone to step up and take the reins at this somewhat-directionless side; the Spanish winger may just be his man. Pablo Sarabia touches, 10/28 vs. Leganés. Goal and assist circled, because I miss John Madden. My son Mikel Oyarzabal’s early goal was not enough for Real Sociedad at Getafe in the early game. Jorge Molina buried the winning penalty five minutes from time after Ángel Rodríguez chested down well and lashed into the net. Getafe have the league’s second-lowest possession percentage (41%) and have completed under 66% of their passes (worst in LaLiga), but they have the look of a solid mid-table side. GIRONA. I don’t care that Portu’s flick into the goal was inches offside, and I don’t care that Real Madrid are going to be absolutely unstoppable come March. This is a result that makes football so great, a newly promoted side from Catalonia taking down a giant from the capital amidst hostile political tensions raging around Spain. Pablo Maffeo was superb at right back, Pablo Machín’s set up was brilliant, what a win. Very positive stuff from Eibar against Levante. I mean, sure, they conceded twice from three shots, but they fought back with their first goals of the month to secure a draw and passed the ball with intelligence and purpose. Anaitz Arbilla took the free kick of the weekend to cap an excellent display. Málaga won! Málaga won! Míchel’s men showed real fighting spirit to notch their first victory of the season, a late Recio penalty handing them a 2-1 win over Celta Vigo. Celta should be much better than they are; a nightmare at the back. The Las Palmas disaster continues unfettered after their latest home defeat, this time to Deportivo. Loïc Rémy scored another excellent goal, but Jonathan Viera went off injured, the Canary Islanders fell apart defensively (again) and got beat 3-1. Celso Borges’ solid season in Depor’s midfield continued two goals off his head. Espanyol notched a solid home win against Betis. Gerard Moreno scored the only goal; I’m telling you, he’s mad underrated. Changing things up a little this week, as I’ll be going day-by-day and giving my reaction to things that happened on Saturday, Sunday and Monday as opposed to giving a game-by-game breakdown. Getafe scored another golazo in what is becoming a curiously frequent (and awesome) wrinkle to their game. It’s been good to see them come back up and entertain a little bit. Solid point away in a 1-1 draw at fellow promoted side Levante. I don’t know what else I can say about Valencia. They’re in another galaxy right now. Not that Sevilla have played well this season — they haven’t, and that inadequacy is coming home to roost — but they fell victim to another spellbinding display from los Che. Gonçalo Guedes may be generating the headlines — rightfully so — but Dani Parejo’s restoration to ridiculously solid midfield pendulum (85 touches, 87 percent pass completion, four key passes) has been huge for this unbeaten side. Gerard Deulofeu’s opening goal should not have counted. But that’s unfortunately how the ball is rolling at rock-bottom Málaga. A 2-0 defeat to Barcelona leaves them with one point from the opening nine games. Míchel is surely on his way out, and I’ve been told that fans want to see old boss Javi Gracia return. It may have been slightly harsh, but the hard facts tell us this: after a 4-0 pasting at red-hot Villarreal, Las Palmas have conceded the most goals in LaLiga. They’ve lost five straight and are in the drop zone. They have no discernible style or identity, and the temporary addition of future Atlético man Vitolo hasn’t helped one bit. Speaking of Atlético Madrid, I’m not sure how they managed to win 1-0 at Celta Vigo and thus stay unbeaten. Celta dominated throughout and were unlucky not to receive a second half penalty for a Gabi handball in the box. Atlético haven’t lost away from home in domestic competition in 10 months. Claudio Beauvue scored the goal of the weekend against Athletic Club. Little Leganés continue to impress after the 1-0 win at Butarque; they are fifth in LaLiga and boast the league’s best defense (three goals conceded). In case you still had doubts, Real Madrid‘s bench is still really, really good. Karim Benzema and Marcelo came off it this time to combine for Madrid’s third and final goal against Eibar, who have the joint-lowest goal return in LaLiga. The Basque side are 17th, winless in five and need to find answers. Asier Illarramendi scored and got sent off, and former Manchester United reject Adnan Januzaj put in a stellar shift which saw Real Sociedad end up fairly unlucky to only draw 1-1 with Espanyol. Deportivo boss Pepe Mel is gone after his (former) side lost 2-1 at home to Girona. Depor survived last season thanks to three awful teams below them and Mel departs with just six wins from 24. Ouch. Espanyol 0-0 Levante. The visitors had to scramble quite a bit to keep their clean sheet in one of the weekend’s two goalless games. Just the way I like it. Athletic Club 1-0 Sevilla. An ugly goal secured a huge three points for the Iker Muniain-less leones (yes, I am still in mourning over my Basque son’s torn ACL). Getafe 1-2 Real Madrid. Madrid got goals from two players who never score — Benzema and Cristiano — to beat a now-consistently feisty Getafe (who scored an offside goal). I pity the next big team that goes to the Alfonso Pérez. Alavés 0-2 Real Sociedad. LA REAL KEPT A CLEAN SHEET! And Mikel Oyarzabal scored. He’s awesome and probably a future Spain star. You should watch him. Atlético Madrid 1-1 Barcelona. Saúl Ñíguez did that thing he tends to do in big games, but Luis Suárez quite literally silenced the Wanda Metropolitano eight minutes from time. Spoils shared, Barça’s perfect start finished. Atleti probably out of the title race. Eibar 0-0 Deportivo La Coruña. The beat goes on for two underachieving sides. Potential good news for Eibar though, as coach José Mendilibar’s new 3-5-2 will hopefully stop his side’s defensive bleeding. Girona 1-2 Villarreal. Cédric Bakambu was a bit forgotten amidst Villarreal’s busy summer of flashy new acquisitions. He’s scored five goals in two games and Javi Calleja’s side are back in the top half. Forgotten no more. Cristhian Stuani’s awesome backheel goal, however, likely will be. Málaga 0-2 Leganés. Leganés into a European place and tied for the fewest goals conceded in LaLiga. Oh, and don’t worry about Málaga, they’re fine. They can’t score, they can’t defend, and they only have Barça away next. Real Betis 3-6 Valencia. This game is my everything. Nine different goalscorers. Valencia’s incredible counterattack blazing to a 4-0 lead before Betis imposed their will and brought it back to 4-3 with less than 10 minutes left. This strike from Gonçalo Guedes, one of the best goals you’ll see this year — which he followed up by racing all the way up the pitch to set up Andreas Pereira’s second half stoppage time golazo. Joel Campbell rising from the dead to lead Betis’ rally. Neto summoning the spirit of Diego Alves to stop Sergio León’s spot kick. Marvelous. Las Palmas 2-5 Celta Vigo. Iago Aspas played as a striker, and you’ll never guess what happened: he scored a hat trick. Las Palmas boss Pako Ayestarán has lost nine straight games dating back to last season at Valencia; in his 14 games as a coach in LaLiga, his teams have conceded an eye-watering 30 goals. Celta Vigo 3-3 Girona. Celta striker Maxi Gomez has been awesome since his arrival from Uruguay’s Defensor this summer, but his side have won just one of the four games he’s scored in. Big point for Girona away, as they calmed down a game that was 2-2 inside 20 minutes. Deportivo La Coruña 2-1 Getafe. Atlético loanee Amath scored a peach of a goal for Getafe, but Depor struck twice in the final 25 minutes to get a much-needed win. Lucas Pérez scored his first since returning to LaLiga last month, and the criminally underrated Florin Andone netted the winner on 87 minutes. Sevilla 2-0 Málaga. I don’t get Sevilla. They’re playing poorly. Eduardo Berizzo has yet to settle on a reliable XI or a reliable formation. And yet…two goals in two minutes from summer signings Éver Banega and Luis Muriel lifted them to second. Levante 0-2 Alavés. Alavés notch win #1 under new manager Gianni De Biasi, late of the Albanian national team. Levante missed badly the presence of midfield destroyer Jefferson Lerma. Leganés 0-0 Atlético Madrid. The less said about this one, the better. Real Sociedad 4-4 Real Betis. So this was the midday match Sunday, which meant it aired at 3 a.m. Arizona time. Naturally. Each goal in this match was answered within 15 minutes. Big takeaways: Joaquín and Xabi Prieto still have it, Betis look like they have another midfield star in Fabián Ruiz (two assists), while La Real right back Álvaro Odriozola laid on another assist and just got his first call up to the Spanish national team. Speaking of Real Sociedad, they’ve conceded the most goals in the division but only Barça have scored more. Watch them. Tough call between this and Daniel Wass’ free kick, but Sergio León’s goal from this match is my goal of the weekend. Tight, close, powerful finish. Barcelona 3-0 Las Palmas. Barça handled Pako Ayestarán’s Las Palmas at an empty Camp Nou, as a large crowd on the day of an independence referendum was deemed too dangerous. (But Mariano Rajoy denied it even occurred??) Sergio Busquets scored his first league goal for three years, Lionel Messi scored his first brace for three weeks. Villarreal 3-0 Eibar. Eibar have been hit for 3+ goals on four separate occasions this season — this time, all from Cedric Bakambu. While their magic appears to be running out, Villarreal may have reclaimed theirs under new boss Javi Calleja. It’s as if playing Pablo Fornals in central midfield is #good. Also, what is the deal with Athletic’s away strip?? No bueno. Real Madrid 2-0 Espanyol. Isco Disco netted a brace as Madrid got back on track. Cristiano Ronaldo did everything but score. Espanyol haven’t stopped Madrid scoring against them at the Bernabéu since 1978 and looked like scoring about twice. Gross. Results: Atlético Madrid 2-0 Sevilla. Atlético have kept three clean sheets in the last four and have held an opponent to zero shots on target twice in that span. I tipped Yannick Carrasco to notch 15 league goals this season; he’s got three already. Alavés 1-2 Real Madrid. At least Alavés finally scored a goal, right? Unfortunately for them, Dani Ceballos scored two, his first career doblete. Considering that apparently everyone is out to get them, this was a Herculean effort from Real Madrid. Málaga 3-3 Athletic Club. Monster result for 10-man Málaga, perhaps granting Míchel a stay of managerial execution. Athletic, up 3-1 with 10 minutes to go, should have had this one, especially after the Aritz Aduriz-Iker Muniain-Iñaki Williams trio created all three goals. Girona 0-3 Barcelona. Girona had a decent chance in this one, as Montilivi is an emergent fortress and Lionel Messi was man-marked and somewhat mortal. Instead, they went and scored two own goals. Oh well. Barcelona remain perfect. Espanyol 4-1 Deportivo La Coruña. I think Pepe Mel’s days are numbered. Espanyol are a total bore and still crushed a Depor side that desperately needs leadership at the back and stability in midfield. Gerard Moreno scored twice — what a fine all-around #9 he’s becoming. Getafe 4-0 Villarreal. One of LaLiga’s more impressive sides through six weeks, Getafe put a second half hammering on a Champions League hopeful. Their defensive structure is sound, they have a strong counterattack, they score beautifully weird goals. This result ended Fran Escribá’s year-long stint at El Madrigal/La Cerámica. Eibar 0-4 Celta Vigo. Eibar have been hit for 3+ goals on three separate occasions this season. Not good. Pione Sisto IS good, however, as he scored from a loooong free kick and assisted two other goals. The 22-year-old winger is finding a home in new coach Unzué’s system. Las Palmas 0-2 Leganés. Guess who’s conceded the second-fewest goals in LaLiga through six weeks? That’s right, little Leganés. And thanks to performances like this one from midfield anchor Rubén Pérez (84 percent pass completion, 12 tackles, four interceptions), the cucumber growers may yet find a way to stay up again. Rubén, level 12 tackling mage. Real Sociedad 2-3 Valencia. The game of the weekend. Two red cards, top-notch goals (watch Nacho Vidal and Mikel Oyarzabal in particular), Valencia win at Anoeta for the first time in seven years because Simone Zaza apparently can’t be stopped anymore. It was so good, Marcelino pulled his hamstring celebrating. Real Betis 4-0 Levante. Betis followed up a stunning win at the Santiago Bernabéu with an evisceration of previously-unbeaten Levante. Tony Sanabria scored twice; Quique Setién’s found his center-forward.